"The American Dream – Think Big"
Following a recent presentation at the main campus in Apeldoorn by Ms. Rasheeda Butler, President of BSG interns, Wittenborg students will now have the possibility to live the "American Dream" by completing a 6 – 12 month internship in the United States of America. BSG, a US recruitment company for Hospitality Interns, specialises in recruiting Hospitality Management students from all over Europe for internships at prestigious private clubs, luxurious hotels and resorts along the east coast. Wittenborg students who are enrolled in Hospitality Management, Events Management and Tourism Management at both Bachelor and Master level are eligible to apply. However, applicants must already have at least 6 months work experience in the hospitality industry. 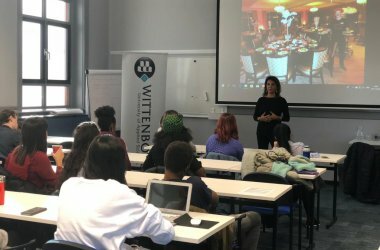 Students have the option of interning for 6 months to 1 year, depending on their study agreement with Wittenborg, and when they plan to graduate. According to Ms. Butler, BSG offers a unique experience to students who are recruited by the company because much effort is put into the students' care and well-being, and into making sure they are placed at reputable companies. Students who are studying within the field of hospitality, events and tourism, who have at least 6 months experience in the those fields, can send in their applications. The company applies for the J1 Visa, which allows a student to live and work on an exchange program in the US for a specified time. The visa application costs around USD 500, and students are responsible for their own flight costs to and from the US. Students will be provided with housing and transport to and from work. In most cases, housing costs are covered by the employer, however, in some rare cases students will have to pay a contribution. There will be days off, of course, with cultural trips and excursions organised to experience American life and culture. Why is it worthwhile for students to take advantage of this opportunity? When asked why she thinks it is worthwhile for students to take advantage of an opportunity like this, Ms. Butler responded: "It's a life changing opportunity. Students get to build their resumés and to stand out from the crowd, which gives them more opportunities". She further commented that the experience "is as much about personal growth, cultural hospitality and social awareness and confidence boosting, as it is about the work they perform during their internship". Ms. Butler encourages students to let themselves go, take opportunities, and see how far they can rise. Wittenborg is working continuously to provide the best opportunities for all its students.